yndi halda release their brand new EP, A Sun-Coloured Shaker through Burnt Toast Vinyl on February 16th 2018. Marking both a thematic accompaniment and a follow-up to their acclaimed 2016 full-length Under Summer, the new EP explores new musical and lyrical ideas, and represents a band continuing to progress their own maturing and developing songwriting. While yndi halda have previously worn the mantles of “instrumental” and “post-rock” music – especially with their 2006 debut Enjoy Eternal Bliss – their recent movements have occupied considerably broader territories. The closely-crafted vocal harmonies and new musicalities of Under Summer have been continued in A Sun-Coloured Shaker, but their form is now embedded into a symbiotic world in which a love of true songwriting, meticulous post-classical arrangement, contemporary indie, choral music, and transcendent longform structure coexist. The band themselves reference inspirations as unexpected as Alice Coltrane, Akira Rabelais and Lonnie Liston Smith, whose influences subtly intertwine with more immediate comparison points. Like a terrible comet coming to hit the earth, and writing a list of things you would save first runs the repeated, principal lyric in the piece’s would-be chorus. yndi halda can be well characterised by this line: their music is of sadness, lament, sorrow, but also full of light and ablution, delivered with joyousness. As we completed our last album Under Summer – having spent 9 years slowly chipping away at the composition, arrangements, production – we found that we were left with small pockets of music that we really loved, but had no home for. One piece in particular felt so attached to the rest of the LP, so much a real part of it, but was nowhere near completion even by the time we had finished working on Under Summer. We knew it had to be a part of the album eventually, but also that it needed more time. So, between tours and obligations for Under Summer, we met to continue writing, and we eventually reached our destination: an accompaniment to the album, a new song that tells the leftover stories. We see A Sun-Coloured Shaker as the passing of night that follows Under Summer’s day. The dawn after the album’s dusk has faded. We wanted to express the realisation that something as simple and everyday as sunrise can be so truly life-giving. That the natural rhythm of nightfall and daybreak is a foundation of reality and being. We recorded the EP in a handful of locations, just like the album, but primarily in a beautiful rural studio named Deep Litter, located deep in the Cornish countryside. It felt like a return to the barn of our first formation and first album recording (though Deep Litter is converted and fully equipped; for Enjoy Eternal Bliss we had to bring in a very rudimentary mobile rig). 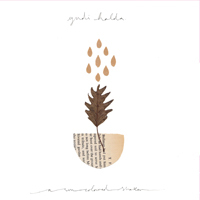 This is the first yndi halda record to feature the band’s new lineup. We now have four singers in the group, as well as keyboard / sound-design, as new members Simon Hampshire (bass guitar, vocals) and Phil Self (keyboard, synth, vocals) join the band. A Sun-Coloured Shaker is released on a one-sided, sun-coloured 12” with original artwork and b-side etching created by the band’s frequent collaborator, illustrator Hannah Clare. USA pre-orders via burnttoastvinyl.com.